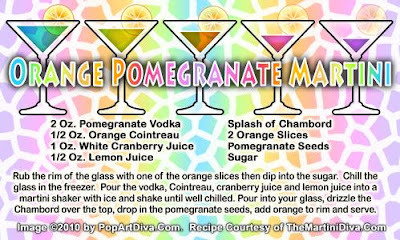 Another great way to enjoy your bottle of Pomegranate Vodka, this Orange Pomegranate Martini gets it's kick of orange from the Cointreau, a powerful orange liqueur that is often used as an apéritif or a digestif. Her I've used this branded version of a triple sec to bring sweetness and orange flavor to the tartness of the pomegranate, lemon and cranberry elements. Instead of pomegranate juice I used white cranberry for a clear martini then I drizzled a little raspberry flavored Chambord over the top to give the martini a nice pink tint. The fresh orange slice and pomegranate seeds for the garnish add that nice fresh fruit finish. Pretty and tasty.